While this answer may not work for every single instance… I have found that inspired, invested and involved piano parents are informed piano parents. The very nature of piano lessons means that it “appears” as though parental involvement is not necessary. Their child arrives at lessons – we say a quick hello and we shut the studio door. We don’t ask much from our parents, and so they do exactly what we’ve asked them to do. They drop off their children, they attempt to make practice happen at home, they come to piano recitals. 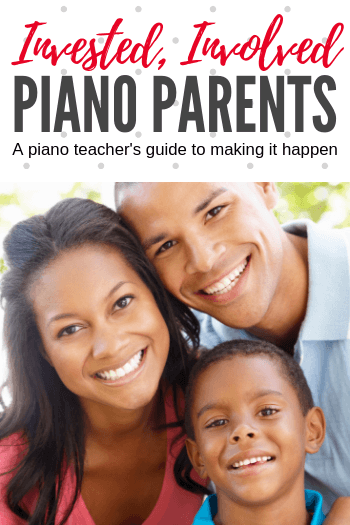 We are up against a huge obstacle when it comes to encouraging piano parent involvement… the majority of our piano parents don’t know the first thing about the piano. They know when to cheer at soccer because it’s clear when a goal has been scored. If someone doesn’t fall in cheerleading, it’s clearly a job well-done. Piano can be a mysterious thing for non-musical parents, and it’s up to us to change this. 1. Clearly communicate what is happening in your studio – You absolutely must have some sort of online presence be it a blog, a Facebook page or a way of texting your studio as a group. If you haven’t yet embraced social media, then at the very least send home a hard-copy newsletter monthly. 2. Invite piano parents into the lesson frequently – You don’t need parents to stay for the entire lesson, but a sneak peek at what their child does in lesson time with you is always appreciated. What are theory games anyway? How do you compose with an 8 year old? Show them…often! 3. Don’t just encourage practice… encourage family practice – Ensure that at least one task for your piano students’ weekly practice involves some, if not all, of their family. Give piano parents the opportunity to be involved by making it very clear exactly what they need to do. If they have instructions they’ll rise to the occasion. 4. Give piano parents bragging rights – Find meaningful ways to frequently recognize their child for musical accomplishments. Piano goals reached are not as flashy as are karate belt levels, national swimming records or a really great back flip… but they should be celebrated as largely. Piano parents can’t be enthusiastic about something unless you tell them what that something is. Involved, invested and inspired piano parents make all the difference to a child’s musical education. If you’re feeling frustrated about the lack of commitment, enthusiasm or interest, remember that you likely haven’t asked for it! Find effective ways of informing your piano parents and you’ll likely see a very positive shift. Stuck for ways to involve the whole family in practice time? Our book “Pssst…Your Piano Teacher Thinks This is Theory” includes tonnes of printable pages that reinforce theory concepts and encourage everyone to get involved in the fun. Print a page per week, hand it out to everyone and watch your parental involvement in your studio change!